FoodTech is a fast-growing industry, with massive potential. The sector saw a total investment of £3.4Bn in the first six months of 2017 alone, a 6% year-on-year increase on 2016, and it doesn’t look like this trend will slow down anytime soon. To celebrate the end of our fundraise, Feedr decided to pull together some of the movers and shakers from the London foodtech scene for a panel discussion on the key industry trends, potential, and how their tech is shaping the future of food, health, and performance. Three key areas arose, prompting stimulating discussion around personalisation, environmental sustainability, and maintaining the human element of community and choice in the information age. Overall, the consensus among the panel was that personalisation is one of the driving trends across foodtech and healthtech, with increased access to personal data underpinning a lot of consumer behaviour. Avi spoke specifically about customised supplements based on a user’s genetic make-up, and how he expects this kind of product to become increasingly present on the market. “As tech moves forward and it enables consumers to do more with their health, all these sorts of disruptive solutions become so much more applicable to our daily lives,” he described. Riya and Nick followed up with the comments that as the results of the information age, people are demanding increased transparency and agency with what goes into their food. Their desires will vary depending on their taste profiles, but we can harness data and tech to build smart products, and put options in front of them we know will appeal to them based on their consumer behaviour. Nick noted that we are only at the beginning of the personalisation trend in food tech. “Spotify is a personalised radio station, Netflix is a personalised tv station, we will see the same thing in food as well,” he says. To round off the discussion, Lauren pointed out that most people are on top of their own wellbeing now, so the conversation has to move to something greater. She says, “Wellness isn’t a selfish pursuit, it is about taking care of yourself as well as being mindful of others,” and highlighting social media movements like #giveashit, and apps like OLIO and Karma that are using tech to reduce food waste across the industry. Around the questions of how sustainability fits in to the business and how it impacts the consumer, Nick brought up the importance of accurate restaurant forecasting to reduce food waste, and how Vita Mojo is using AI to help restaurants forecast their sales based on a number of factors including the weather, local events, and if the World Cup is on. Forecasting demand is still a challenge to most restaurants, and a leading cause of food waste at the kitchen level. “There are many causes of food waste,” he says. “One of the biggest culprits for restaurants is that they can’t accurately forecast sales. They order their food 1-2 days in advance, so if you know the exact sales forecasted by line item – how many kilos of potatoes or chicken you’re going to need – then you’re not going to have a lot of food waste. 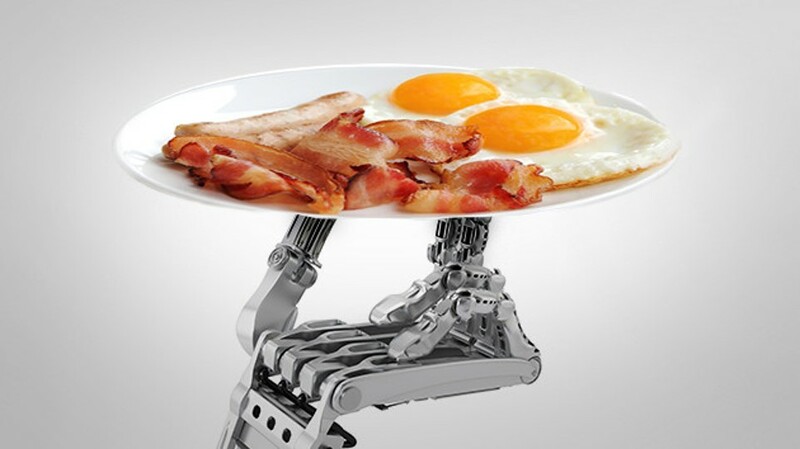 In reality, they aren’t good at this, and even if they under-order, their food waste still goes up because they might have shortage of one item, which means the other items that go with it in a dish will go to waste.” We help, using AI. Riya added to this by speaking about the importance of sustainability, and how having it as a core pillar of the business creates a strong emotional pull from the customer perspective. “We only work with vendors who produce simply, without a lot of the preservatives that have become so prevalent. It’s about local, it’s about seasonal.” She went on to describe how working with the same users everyday allows powerful harnessing of individual purchase pattern behaviours to build up clear images of their taste profiles. This, combined with the pre-order element of the business model, allows their vendors to drastically improve forecasting accuracy, and so drive down food waste at the end of the chain. To round off the discussion, Chris challenged the panelists by asking them what a highly personalised, data-driven food experience would look like, and whether it would reduce us to “human guinea pigs, being told what we are going to eat”. Food has always been something that brings people together – technology shouldn’t detract from that, so much as enhance it. The panel closed with a dynamic Q&A session, while guests enjoyed rice paper rolls from Kaleidoscope, and wraps from Nusa Kitchen, along with drinks, including beer from Two Heads Brewing Co.
A huge thank you to everyone who came, to our fantastic panelists, our food and drink providers, and Founders Factory for hosting us in their space. It was truly a wonderful and insightful evening about the progress happening in this relatively new, but incredibly dynamic and exciting industry.